As if robbin' your way across the wild west wasn't living dangerously enough, why not bet all your money for an extra thrill. That's where our Red Dead Redemption 2 Gambler Challenges guide comes in. 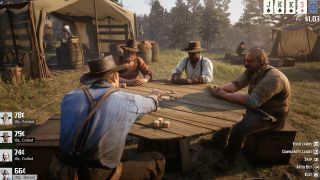 Whether it's Red Dead Redemption 2's five finger fillet, dominos, blackjack or poker we can help you tick off all the challenges in this list faster and easier. Like all the other challenges you can't just collect all the Red Dead Redemption 2 Gambler Challenges and do them at once, only one at a time. It's not the worst things in the world, but it will take a little extra effort so let's get started. You’ll not only need to know how to play Poker to complete this challenge, but know how to win, not to mention find a table to compete on with other characters in Red Dead Redemption 2. You can start your first match in an early story mission, Who is Not Without Sin, while other tables can be found in towns and saloons throughout the world, but you’ll need to chip in a few dollars for entry beforehand. In Blackjack, doubling down means to increase your inital bet twofold, usually when the player is confident that their hand can win. Sit down at the Blackjack table at Saint Denis or Blackwater in Red Dead Redemption 2 to try it out for yourself. You’ll need quite a bit of money, especially if you don’t win the hand after doubling down, but once you understand the rules a bit more, you’ll have a good shot at completing this challenge over time. You can play five finger fillet with several gang members at camp for a small entry fee of $1. To win, you need to beat your opponents record time at alternating the knife between your fingers by pressing the telegraphed buttons as quickly as possible. It may take a few tries, but you should have this challenge beat within minutes. To "bust" in Poker means to force another competitor out of money so they have to leave the table and the game altogether, and you only need to bust one player out at each table in the three named locations to complete this challenge. The best way to do this is to cajole someone into going 'all in' by raising the stakes to a considerate level. If you win, they'll have to call it. If you lose, no worries, just rejoin the game and try again until you finish the challenge. To win dominoes, you need to get rid of all your tiles as quickly as possible, but will be forced to draw one whenever you can't play your turn. You can compete in rounds of dominoes with gangmates back at home camp, which is the best place to finish this challenge as the entry fee is only a single dollar. Find the Blackjack table in both the towns of Rhodes and Van Horn to begin this challenge. To beat the dealer, you'll need to place a bet and win the hand against them during each round, so make sure you have enough money to begin the gamble in the first place. Five finger fillet requires you to press a series of buttons quickly in succession as Arthur navigates the knife between his fingers. To complete this challenge, you'll need to beat your opponent at every named location by besting their record times. A "hit" in Blackjack means asking for another card to add to your hand, which can be risky, as if you go over 21 then the dealer wins by default. Still, you'll need three rounds with three hits for this challenge, so it may take some time (and money) before this one is complete. Only ask for another card when your total number is low enough to take the hit, and cross your fingers that the hit won't bring you over the 21 limit. Simple and straightforward enough. Just keep playing dominoes back at camp as best you can untill you score a hat trick. If you're struggling for wins, use the in-game rulebook for advice on domino tips and strategis for securing a victory. Just like Gambler 9, this challenge requires three consecutive victories of a single game type but, unlike dominoes, Poker is a lot harder to win when luck is such a big factor. Once you have enough money to play at least ten rounds or more in succession, join a lowball poker table like the one at Valentine and keep participating untill a hattrick comes your way. With that, the Gambler Challenge set will be done and dusted, and hopefull you won't have lost too much money along the way.